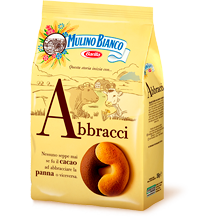 Abbracci by Mulino Bianco are rich and creamy biscuits are made with cream and cocoa. Abbracci translats as "hugs", the pleasure of two different flavours put together for a delightful snack! Mulino Bianco offers a wide selection of biscuits - whichever you choose you are sure to find something special! Wheat flour, sugar, butter, vegetable margarine, eggs, cocoa (2,4%), fresh pasturised cream (1,7%), powdered skimmed milk, honey, raising agents ( ammonium acid carbonate, sodium acid carbonate, cream of tartar ) cooking salt, vanilla flavouring.